Protecting thousands of students, with irregular hours, and multiple block and campus access needs isn’t easy. Student accommodation blocks are usually large, with high traffic moving from bedrooms to common areas, canteens and libraries. A single student moving between her room, a study area, the fitness centre and a couple of trips off-site could use secure doors easily 15 times a day. And student turnover puts a further admin burden on security managers. Hundreds of students leave and start in any given semester. Physical keys and mechanical locks lack flexibility and don’t offer the control that managers need. It can also become expensive with the continuous loss of keys and replacement of cylinders. And how can you know if one has been copied? Much of our student accommodation is also housed in older buildings, meaning a full retrofit which can be tougher than working from scratch on a greenfields site. Mechanical security is not the answer. Mechanical locks don’t provide a security manager the information on who accesses which areas, and it’s tough to control who has keys. There’s no real-time monitoring and you can’t generate detailed audit trails for locks or users, meaning there’s no easy way to track unauthorised access in cases of a theft, for example. • A system needs the product and software robustness to handle high traffic, many users, and fast student turnover. • A system should make student life easier with cards or a PIN code system, rather than keys. • A system should secure more than just doors, and include cabinet and cupboard locks, or student lockers. • A system must be easy to upgrade as buildings are upgraded, adding new doors and upgrading the functionality of the devices already installed. 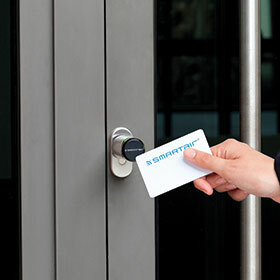 SMARTair is battery operated and wireless, meaning incredibly easy installation on each door. • A system should be able to handle additional student services like the vending machines or canteen on the same access card as the room door lock.